Fall is upon us and although there are many amazing aspects to the season, such as the start of school and Thanksgiving, the changing leaves and fall colours are arguably what make it such a beautiful season! 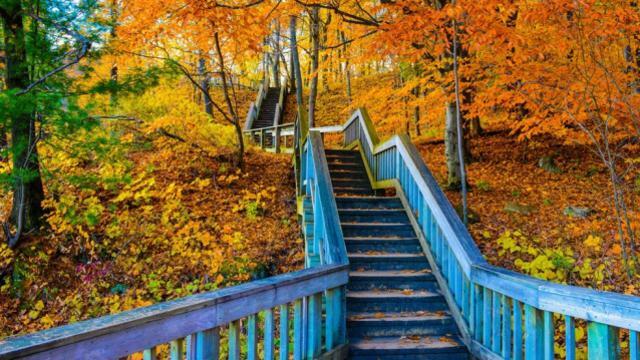 Living in southern Ontario means that we are lucky enough to experience some of the most beautiful fall scenery! Warm yellows, reds, and oranges can be seen everywhere! Even the sound of leaves crunching underneath your feet is satisfying! When searching to experience this beautiful foliage, it’s important to be careful of uneven ground, and physical limitations. Be sure to research locations that can accommodate your needs and enjoy the best there is to see! Rattray Marsh is located just off Lakeshore Road in south Mississauga and is the last remaining lakefront marsh between Toronto and Burlington. It is a unique setting that offers an even more interesting experience! You won’t find anything like it in all of Mississauga! This sensitive wetland is only enhanced by the beautiful fall colours. Kariya Park is located in the city centre quite close to the Active Adult Centre of Mississauga. The famous Absolute Towers and Civic Centre clock-tower can be seen through the foliage in the park. The location of the park makes it perfect for a short trip during the day, no need to fully commit to a days worth of hiking but you still get to experience the beautiful fall colours! Erindale Park is the largest park in the city located off of Dundas St West near the University of Toronto Mississauga campus. It is home to multiple picnic areas so you can enjoy a meal while gazing upon the beautiful scenery. The star of the park, in the fall, is the David J Culham Trail, a heavily forested area that displays panoramic views of fall colours. North Mississauga is home to the Meadowvale Conservation Area. Explore the Credit River’s floodplain while experiencing the beautiful leaves. The floodplain allows for flat lands making easy walking for park-goers! Located in central Mississauga along the banks of the Credit River. This park has many natural features that park-goers can enjoy such as: woodlands, meadows, creeks, former agricultural lands, and the stunning Credit River that host spawning salmon in the fall. The Riverwood Conservancy is said to the most ecologically diverse community in the Credit Valley Watershed; not only do you get the stunning foliage but interesting wildlife as well! Mississauga is home to stunning city-scapes, a beautiful waterfront, and wonderful hiking trails all within one city! Now is the time to explore it! Learn more about our Walk-a-Thon!